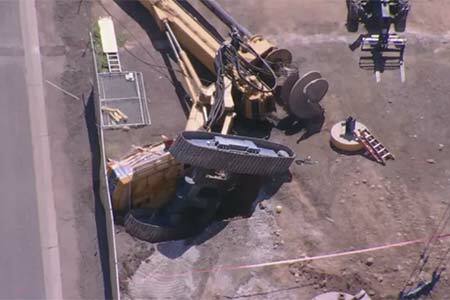 Phoenix, Arizona—Melvin Self, age 52, was killed when the drilling rig he was operating toppled onto its side as the walls of a newly excavated hole collapsed. The tragic accident occurred on Monday at about 9:30 a.m. at a construction site for the PHX Sky Train at the west end of Phoenix Sky Harbor International Airport. The downed crane blocked access to the hole, trapping Mr. Self. Despite extraordinary efforts of the Phoenix Fire Department, responders were unable to move the rig. Its size and weight complicated the nature of the rescue and required specialized resources. Construction workers removed some of the rig’s heavy components in an effort to reposition or lift it. None of the equipment readily available was capable of moving the downed crane. Captain Jake Van Hook of the Phoenix Fire Department ordered that a larger crane be transported to the site. Rescue and recovery efforts spanned a period of more than four days. A representative of Hensel Phelps, the general contractor for the job, explained that the ground at the site is unstable due to its sandy texture. Operations required the removal of 50 tons of dirt, which left a hole 75 feet wide and 22 feet deep. Throughout most of the week, about 100 people were on site, dedicated to recovering Mr. Self’s body, which eventually was recovered on Thursday evening. Phoenix Police and the Maricopa County Medical Examiner’s Office will oversee the investigation. We extend our condolences to Mr. Self’s family and friends at this time of great loss for them.